This explains how to show addresses in a SharePoint 2010 list on a Google Map. 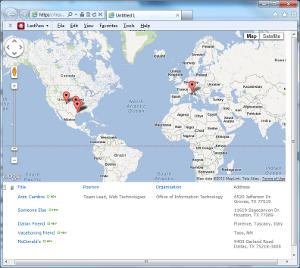 This article is based on Kyle Shaeffer’s Plotting Your SharePoint 2010 List Data on a Google Map. The main difference is I upgraded his method to Google Maps API V3. 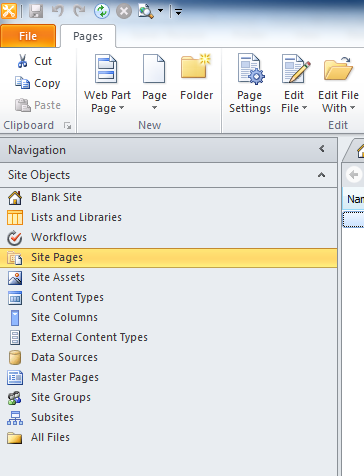 Under Site Objects, click Lists and Libraries. In the Lists and Libraries tab, click Custom List. Enter MyData and press OK.
Click on your new list, then select Edit list columns in the Customization section. Add a Multi Lines of Text field using the Add New Column button at top left: . Name it Address. In the ribbon at top, select Page > ASPX. Name your new page map.aspx. Click on the new page, then click Edit file in the Customization section. If asked to open the page in advanced mode, click Yes. Now you’ll see your data in a table in the page. You’ll need to reference two script libraries: Google’s Maps API and jQuery. // this is called with body's onload to pull addresses after the page is done loading. Replace API_KEY_GOES_HERE with your own Google API key. Don’t have one? Get it at https://code.google.com/apis/console/. Be sure to get a Google Maps API v3 key! v2 is deprecated. Viola! You have a map that dynamically pulls from the below list! The first item with class ms-rtestate-field and gets its text contents. This will be your address. The contents of the a tag within the first element with class ms-vb-title, which is the title field.